Kiwime's Kreations: Update - Fledged!! After several days of chatting to the wee starling in the box, and it would sit there and chat back, this morning it fledged. I saw it several times on the back lawn, and you could see it getting stronger and stronger with each attempt at flight, although its navigation needed quite a lot of improvement, even when I took this photo a few moments before he disappeared. We have not see it since mid-morning, but are so glad that we got to see him fledge. What a lovely post. How lucky you were that this starling would chat back to you, I can imagine the pleasure it gave to you and to DH. And to witness something like a fledging! Fascinating - so glad there were no predators about. Maybe this particular starling will come back to see you and even start his/her family in your box. We once had a blackbird visit us over and over again, year in and year out - we knew it was the same one because of his rogue feather. I was so upset when he didn't arrive one day but I think we now have some of his children as we have other blackbirds with rogue feathers, just not in the exact same sport as our original little man. Thank you so much for this wonderful post Maxine. That's so sweet and heartwarming ! Nature is just GREAT! Ohhhhh that is so nice!!! beautiful picture! How cool! My cats would be pleased that the bird talked back to you. They talk to the birds when they see them but the birds never talk back. 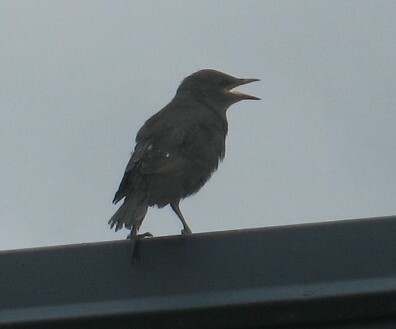 That's need to you got to see the starling fledge. .... yes I talk to birds etc too and sometimes think they talk back like when I freshly clean the bird bath for them, it gives pleasure anyway.